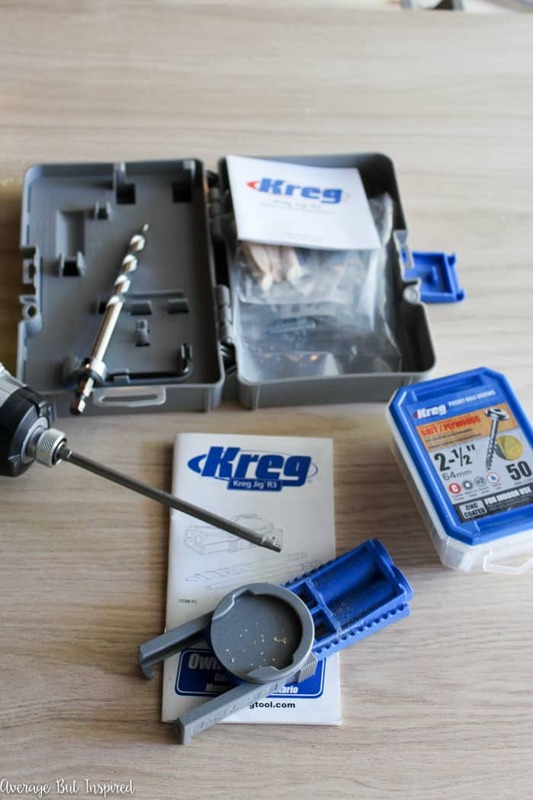 Thank you to Kreg Tool Company for sponsoring this post. The project and opinions are all my own! Also, this post contains affiliate links. Please see my full disclosure policy here. 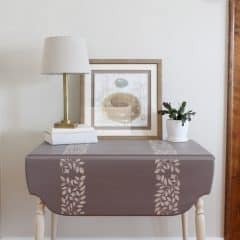 Years ago when the ladies of the Monthly DIY Challenge and I started up this whole thing, I knew there would be times that I’d be pushed out of my comfort zone and forced to use a material, or work with a product, with which I was unfamiliar. 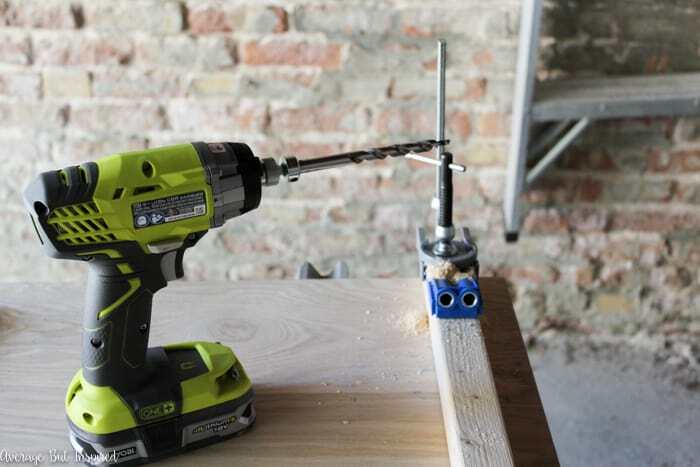 The biggest challenge for me came this month, when we teamed up with Kreg Tool Company to use their Kreg Jig® R3 pocket hole system in our DIY projects. 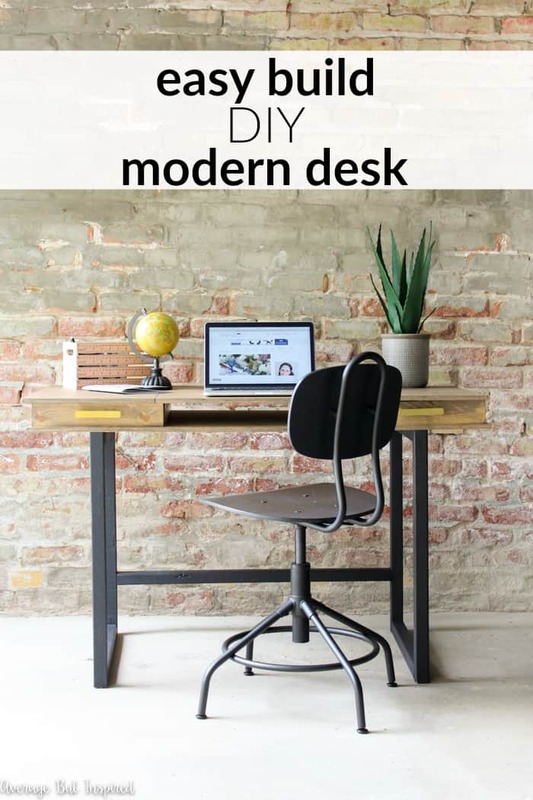 I used the Kreg Jig R3 to create a gorgeous DIY Modern Desk for my sister, and I am THRILLED to tell you that ANYONE can build this desk (I swear. I NEVER thought I could build something like this.)! 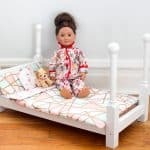 I’m going to give you all of the details on how you (YES YOU) can build something similar in just a minute, but first, take a sneak peek at all of the projects my friends created with the Kreg Jig R3. 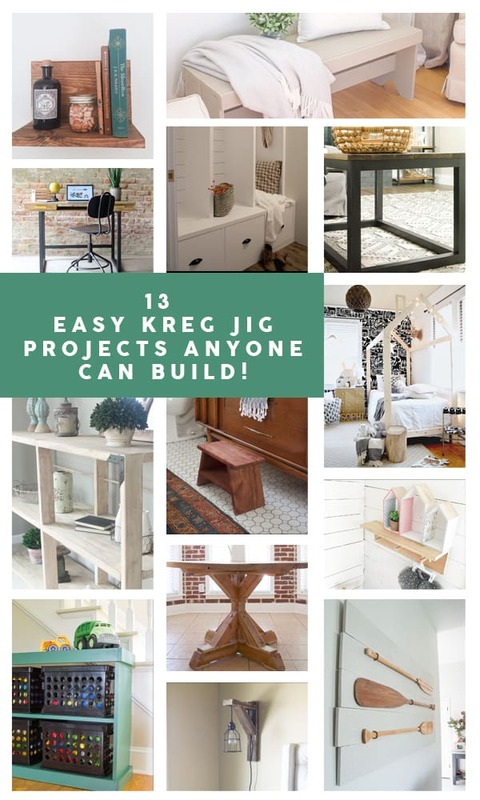 You’ll find links to all of their projects at the bottom of this post – right before the entry form to win your own Kreg Jig R3! 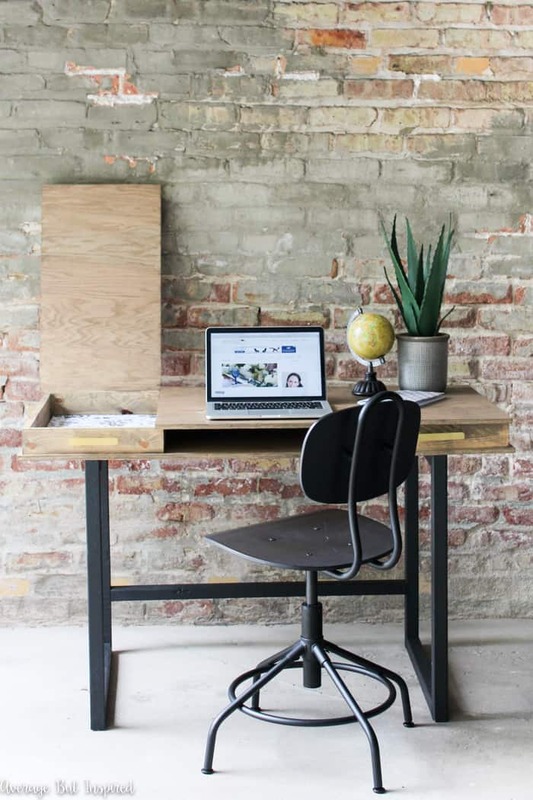 OK, so before I show you how I put this all together, let me tell you that I downloaded the plans for this desk from Ana White’s website, where she provides tons of FREE woodworking plans! I chose her Modern 2×2 Desk Base plan and her and her Desktop with Storage Compartments plan. 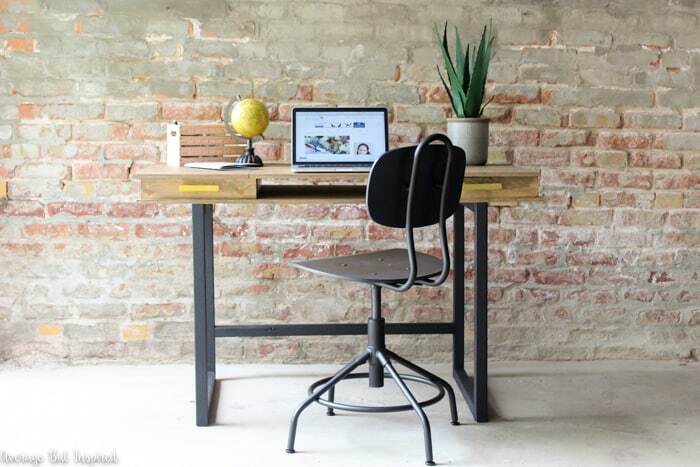 If you want to build this desk, go to those links and download those plans. Then come back here and check out my process photos as they might help you a bit. Anyway, once I was armed with those instructions and supply lists, I headed off to the store to buy my lumber and some other supplies. And I have a confession . . . I was actually really nervous to go buy the materials for this project! I was scared that I wouldn’t even be able to load the lumber into my cart or get it home. Once I purchased everything and got it into the car, I actually cried a tiny bit from relief. Can you believe it? That will tell you how much of a building novice I am! With the scary supply shopping part finished, I felt a little bit better about the whole prospect of building a desk for my sister. Something about being in the comfort of my own home/garage made things seem a little better. 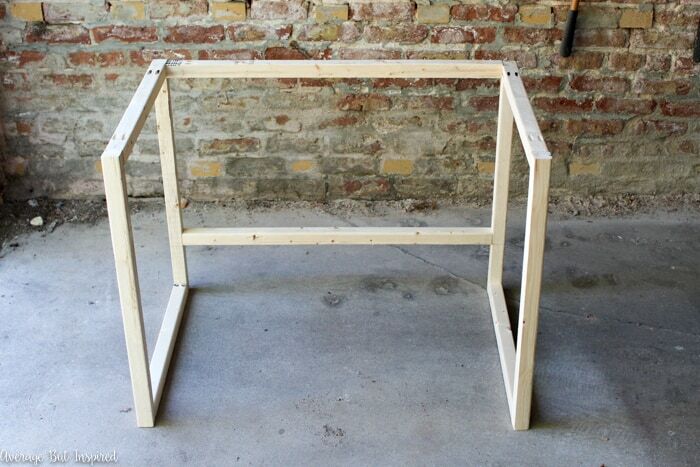 I decided to start by building the base of the desk. I grabbed my circular saw and cut the pieces for the base. Next it was time to start putting the base together, and here’s where I started to get nervous again. 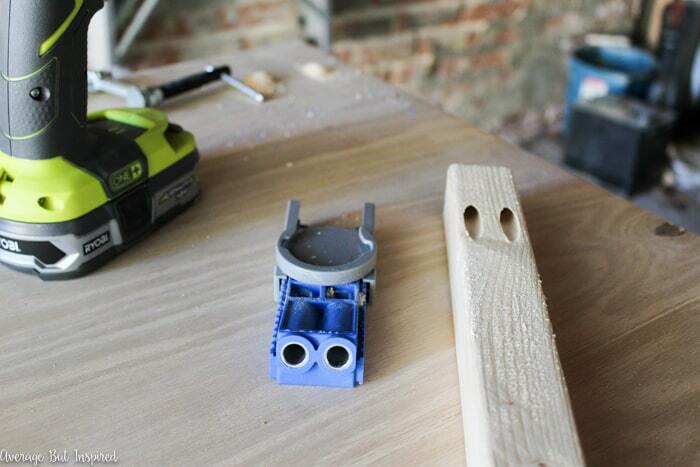 I had to use my new Kreg Jig R3 pocket hole system to do this, and frankly, I didn’t know what I was doing! 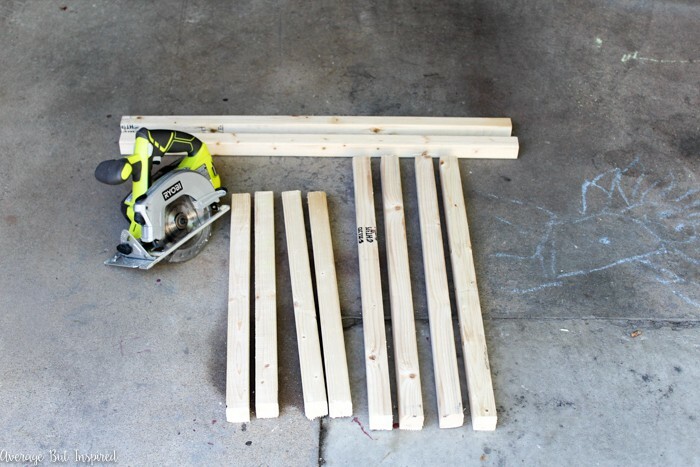 Once I watched this helpful video and practiced on a few scrap boards, I got the hang of it and instantly understood why people love their Kreg Jig systems so much! 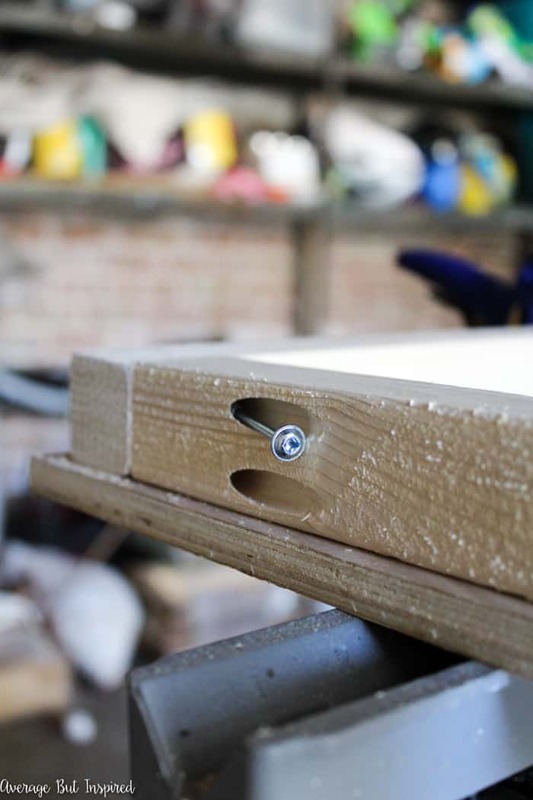 Kreg Jig pocket hole systems let you create pocket hole joints (which are very strong joints), quickly and easily, by drilling an angled hole through one board, which allows you to then drill your screw through that hole and into the other board. In addition to pocket holes providing strong joints, they’re also really nice because you don’t have visible screws on your projects; they’re hidden! See those holes in the wood pictured below? Those are the pocket holes that I drilled using my Kreg Jig R3 drill bit. 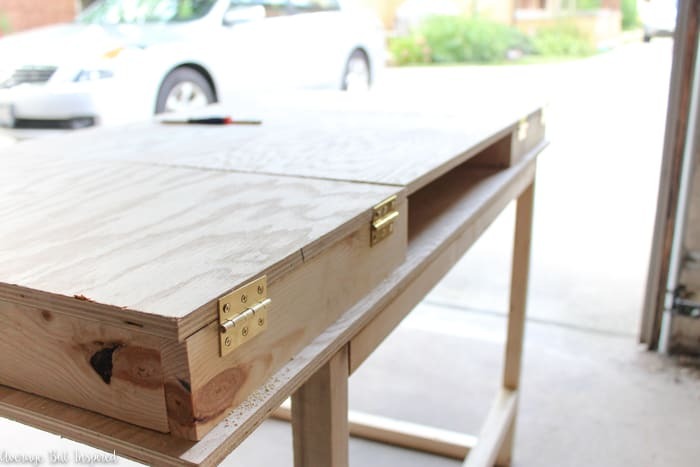 Once I had all of my pocket holes drilled, I fastened the base pieces together with the 2.5″ pocket hole screws that were recommended in my desk base plans. See how I drilled the pocket hole screw right through the pocket hole into the other piece of wood? I put them all together, fastening them with my 2.5″ pocket hole screws and ended up with two base pieces that looked like this. 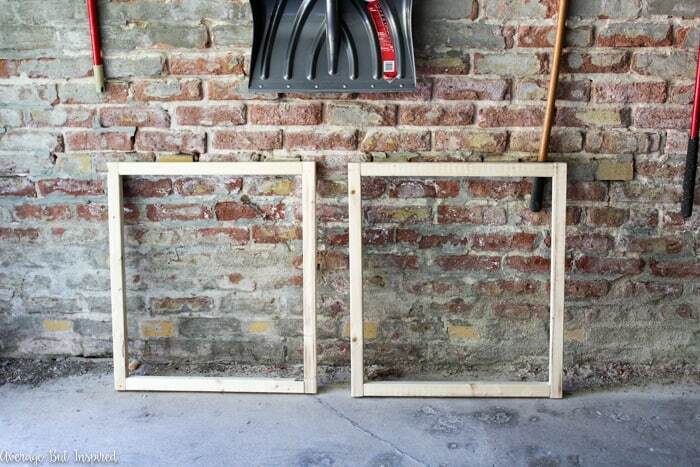 Following the desk base plans, I clamped these two pieces to my temporary work table, and screwed the top bar to both of the squares in order to attach them. Next, I screwed the footrest bar 6″ from the bottom. 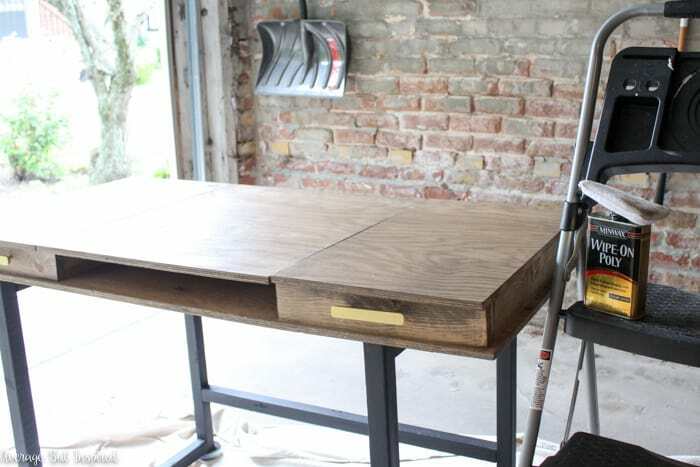 And with that, the base of my DIY modern desk was finished! Because this part went so smoothly, I decided to keep going and build the desktop in the same day. I was on a roll and had to keep my momentum going! 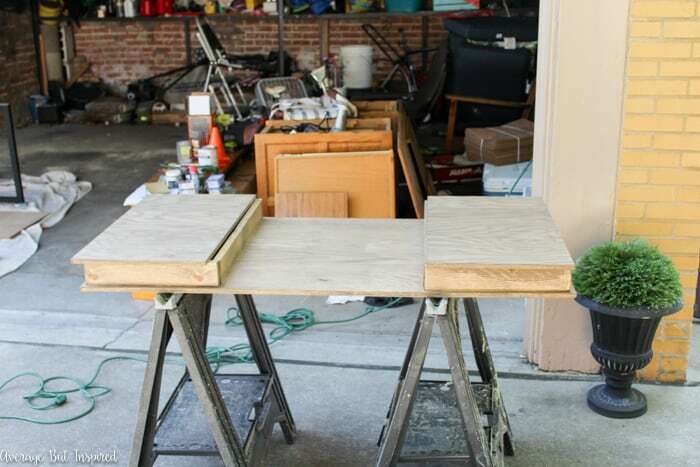 The first thing I did for the desktop was cut 1×3 boards with my circular saw, per the desktop plans, in order to create storage compartments within the desktop. Then I drilled my pocket holes with my Kreg Jig R3 system, and attached the pieces together with my 1.25″ pocket hole screws. Next, I laid those storage compartment pieces on top of the base piece of my desktop. 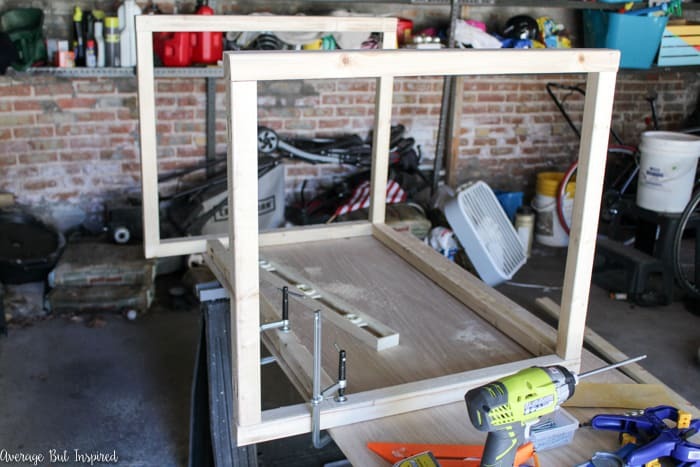 I traced around them with a pencil and then drilled pilot holes in that piece of wood so that it would be easier to attach the compartment pieces to the desktop base. Once I did that, the desktop looked like this. 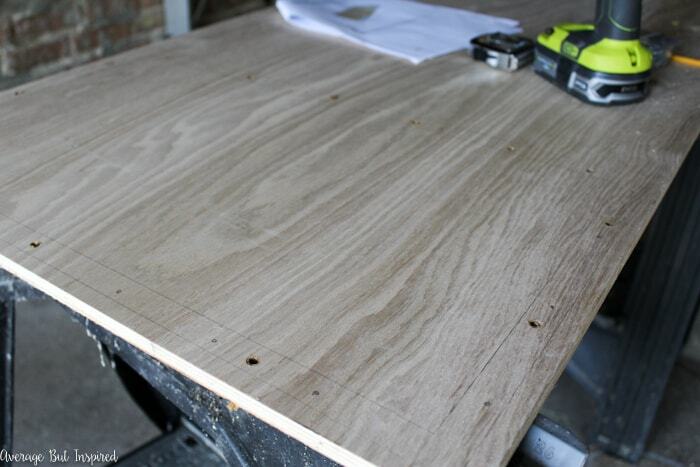 Anyway, after the desktop pieces were cut, I fastened the outer pieces to the top of the desk with hinges. 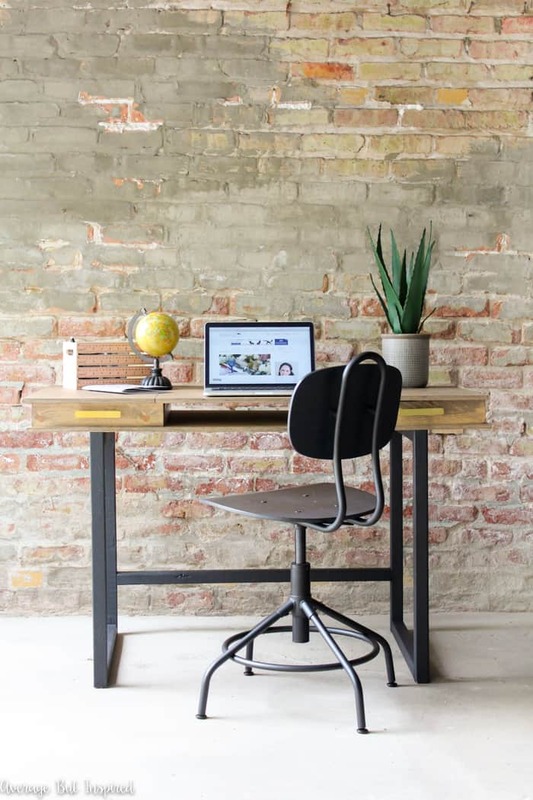 And then, not pictured here, I fastened the middle part of the desk with my super fun new brad nailer, which made attaching the desktop a breeze! That completed the building of the desktop! The next day, I painted the base of the desk with matte black chalk paint. This made the legs look like they are metal! I gave it two coats of poly on top to protect it, and after it dried, I added decorative hardware to the front and screwed the desktop onto the base to fasten it all together! Once I finished building this desk, I had a sense of accomplishment unlike anything I’ve felt before. It may sound crazy, but building this desk made me prouder than graduating from law school! I think it’s because I didn’t really know if I could actually pull this off or not. And when I did, it gave me so much confidence and determination to take on another building project. If you’ve ever thought that you want to try building something, I really encourage you to do it. 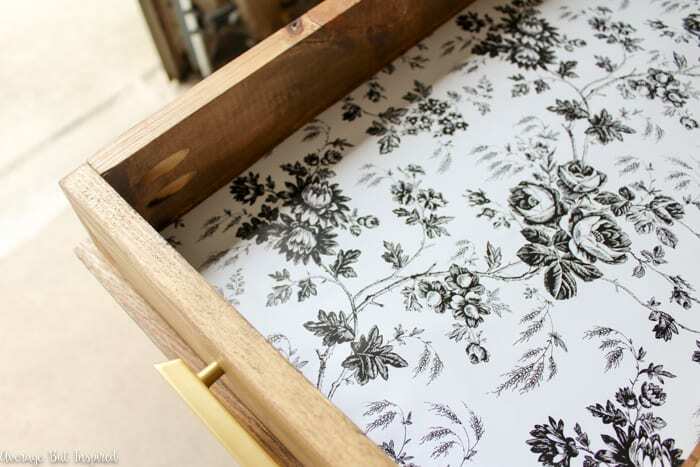 It is so gratifying to see the results of your work come together in a finished piece like this! 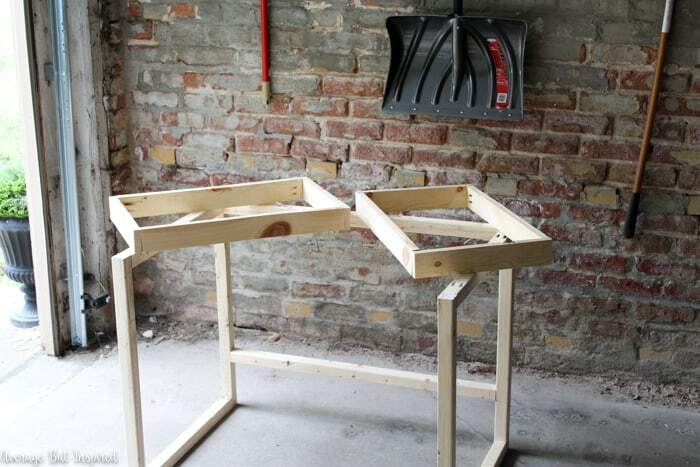 I have to be honest, it made me so proud to see the way my kids reacted to my DIY desk, too. Every time someone came over to our house, my daughter would bring them to the garage to see what I built. That is an immense sense of pride and accomplishment to know that my kids are watching and excited about what I’m doing, too. And, it felt really good to bring my sister her desk and see how perfectly it fits in her apartment. 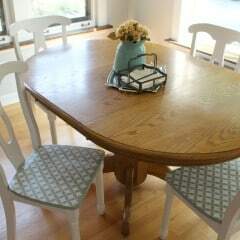 I’m so thankful for the opportunity to have been pushed out of my comfort zone and learned how to use the Kreg Jig R3. 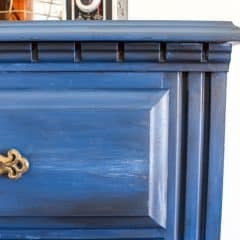 Not only did my sister gain a beautiful piece of furniture that is well-constructed with strong joints, but I gained a sense of accomplishment that has me dreaming up my next DIY project! 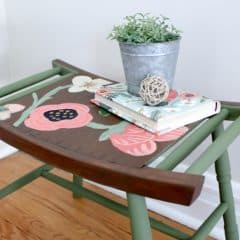 Now that you’ve seen what I made with the Kreg Jig R3, please make sure to visit my friends’ projects, too! You are going to be AMAZED at what you can do with this handy tool! Got Scrap Wood? 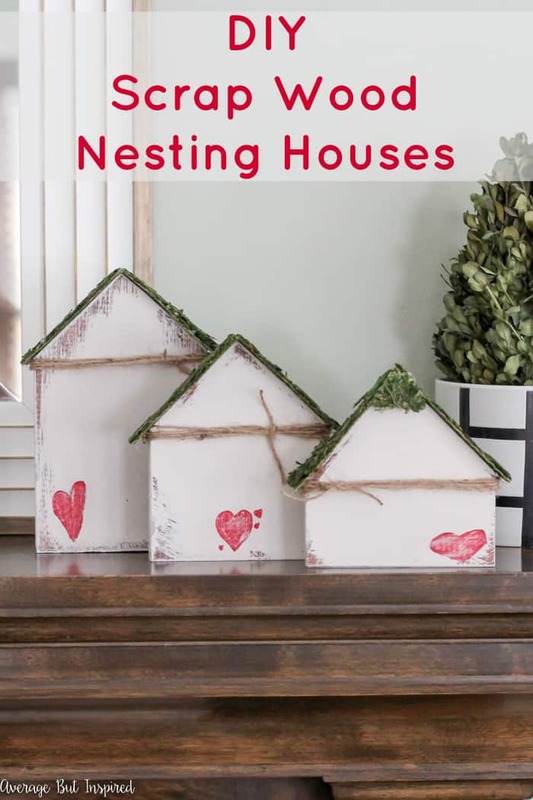 You Might Like To Make These DIY Scrap Wood Nesting Houses! Oh my goodness Bre! Look at you go!!! It’s amazing!!!!! Bre, your desk turned out so good! I totally agree with you- this was one of the best challenges to date and totally pushed me out of my comfort zone as well. You did a fantastic job! 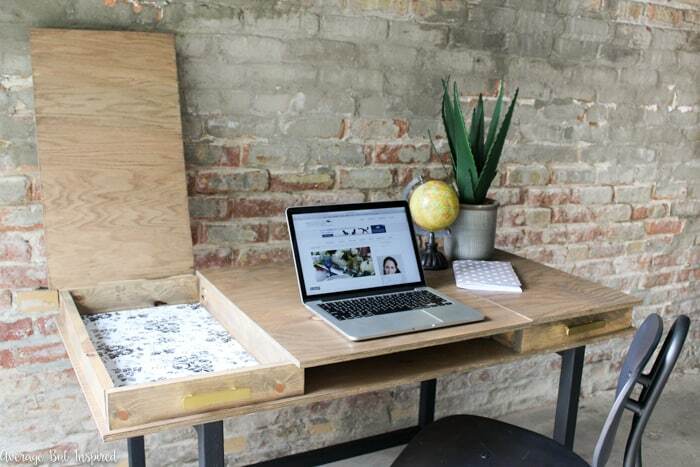 Ahh I’m so obsessed with this desk!! It’s perfect in every way! And the paper on the inside is super cute. Way to go Bre, you totally killed this build!! Bre! I’m seriously so impressed with this! it turned out amazing! This is amazing! 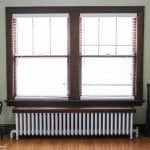 It always seems so intimidating to use power tools or try your hand at a large piece of furniture, but you nailed it! 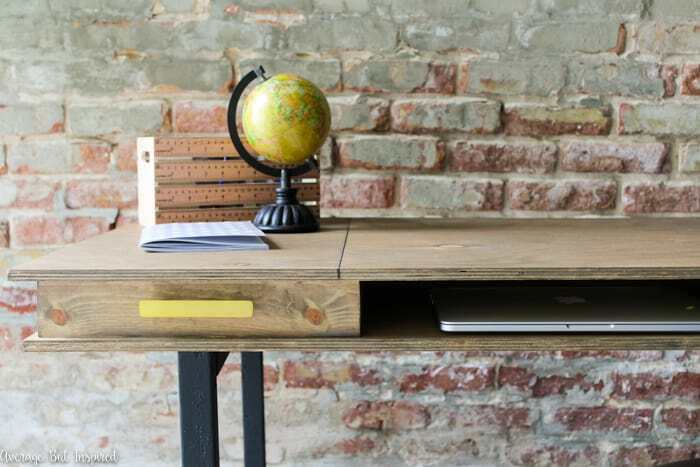 I would love to try my hand at a Murphy-style fold-away desk for my eldest’s room! Dang, girl! 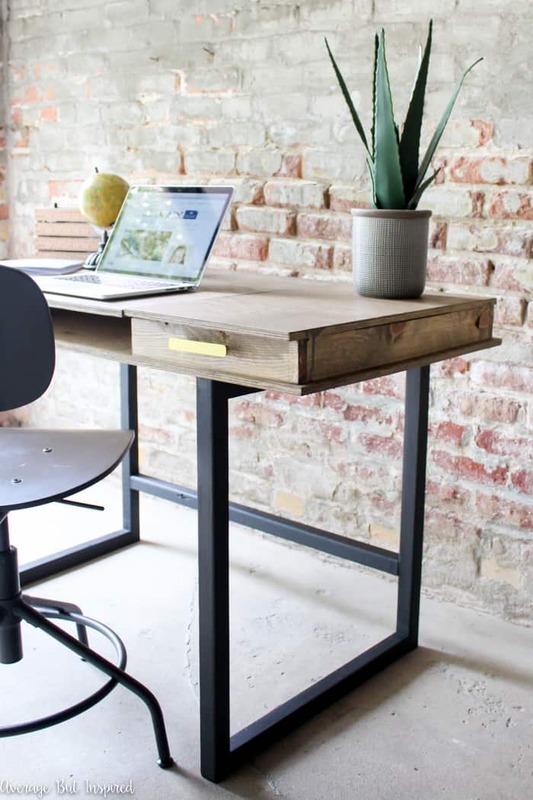 You could not have chosen a more beautiful desk for your first time. It’s just superb and you’re an inspiration for sure. 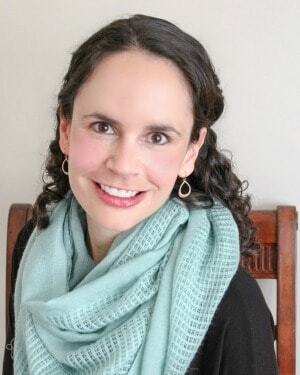 I’ve always wanted to try Anna White’s plans but, for whatever reason, just haven’t. Seriously wonderful, Bre! 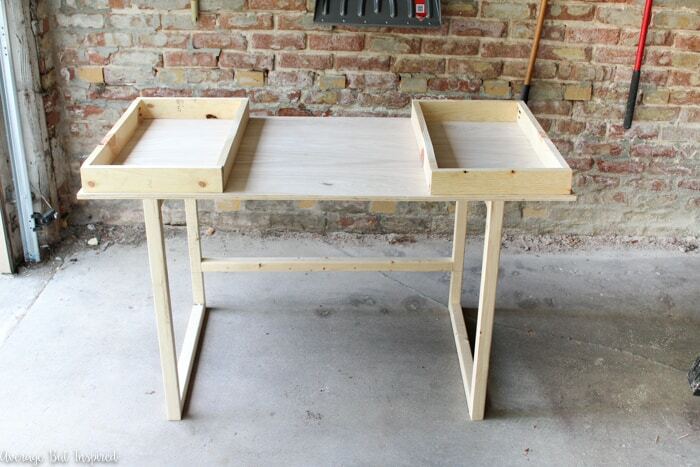 I’ve been wanting a KREG for a while now and after seeing your awesome desk I can’t wait to try my own hand at some cool projects. 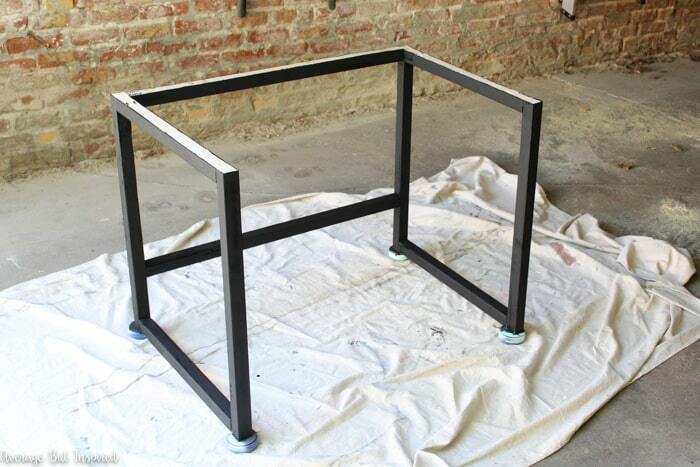 I’d like to make a foyer table. Thanks for sharing such great photos and inspiration.